The so-called "Moa's Ark" theory – that New Zealand's animal and plant life has evolved largely untouched over 80 million years since the Gondwana supercontinent broke up – is being challenged by new molecular evidence from native birds. Dr Steve Trewick and Gillian Gibb, from the Institute of Natural Resources, have carried out a review of the molecular phylogenetic evidence for New Zealand’s bird life. The study examined all available molecular data that has been used to explore the relatedness of birds around the world, including New Zealand species. This includes studies of now extinct birds including moa, some populations of kiwi, and the giant eagle. This observation supports the hypotheses of eminent biologists of the 1950-1970s, including Sir Charles Fleming and Robert Falla. It is also consistent with emerging understanding of the formation of the New Zealand islands, which are much younger than the separation of the now largely submerged Zealandia micro-continent from Australia and Antarctica about 80 million years ago. Some species are so like those in Australia they cannot be distinguished, even with molecular data. At the other extreme are some that certainly share ancestors with Australian species but are very different. For example, the giant eagle evolved within the past two million years and is most closely related to a small Australian eagle. This follows a review of carried out by Dr Trewick and Otago University's Dr Graham Wallis, which examined patterns of biodiversity in New Zealand and information about the origins of local plants and animals. A consistent finding is that the biota is much more youthful than previously thought, but is in keeping with up-to-date geological evidence on the age of New Zealand. 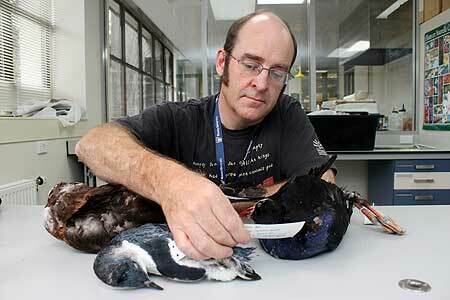 “One of the conundrums has been the gappiness of the New Zealand avifauna,” Dr Trewick says. “We have two honeyeaters but there are more than 70 in Australia, one kingfisher compared to 24 in Australia, two common birds of prey but there are far more nearby. The paper Vicars, tramps and the assembly of the New Zealand avifauna: a review of molecular phlyogenetic evidence, was published in IBIS: The International Journal of Avian Science.